Why choose rii mini i8 black wiress keyboard? 1.Unique New mould with Rii Mini i8 logo, own patent in USA and Europe, strict channel control, no copy and fake in this list. 2.wonderful user experience Compatible with Rii® i8 function, quailty and design improved, more beautiful, more comportable for using. 3.Works well even though long distance Improve wireless range up to 15 meters, multi-touch. 4.Complete function Touchpad DPI Adjustable functions, 92 keys QWERTY keyboard. 5.Wildly support systems · HID compatible device · Terminal with USB port · Windows 2000 · Windows XP · Windows Vista, Windows CE, Windows 7, Windows 8 · Linux (Debian-3.1, Redhat-9.0, Ubuntu-8.10, Fedora-7.0 tested) · Android OS (With standard USB interface). 3 in 1 multifunction: wireless keyboard Touchpad mouse, small and exquisite. 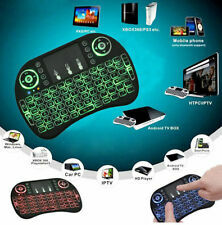 Mini Wireless Keyboard Mouse Touchpad for PC, Pad Google Andriod Tv,Set Top Box, Iptv,TV dongle, etc. Ultra sensitive touchpad with 90-degree flip design. Mini 3 Colors Backlit i8 2.4GHz Wireless Keyboard Touchpad for Android PC TV Box. 92 keys, Built-in high sensitive smart touchpad with 360-degree flip design. Touchpad DPI adjustable functions. Increased LED backlit function, you can use the keyboard in the dark with LED lighting QWERTY keyboard. No box, Portable Foldable Folding Wireless bluetooth Mini Keyboard For iPhone PC Tablet. Comes with usb cable. Shipped with USPS First Class Package. Compact, sleek and modern design. Receiving range up to 35 feet. Use with iPad™, Android™, Surface™, Kindle™, Nexus™, Galaxy™ & more! New in Box. The plug-and-play wireless keyboard connects via USB dongle and includes a 90-degree flip touchpad and enhanced function keys. 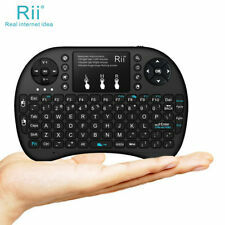 Rii i8 Black Mini 2.4GHz Wireless Keyboard Touchpad for XBox 360 PS3 Android TV. Condition is New. Shipped with USPS First Class Package. Trending at $15.74eBay determines this price through a machine learned model of the product's sale prices within the last 90 days. Note: 1. It’s not compatible with Nokia phone in Windows 8 operating system. 2. After connecting with the device, you must press Fn relative OS key(Q for Android, W for Windows, E for IOS) to select operating system, otherwise all these keys’ function are invalid. 3. You can only use these functions by pressing Fn and the same color key together. 4. Fold it to power off the keyboard for energy saving if it is not in use. Do not use it out of the operating range. Package Contents 1 x Bluetooth Keyboard 1 x USB Charging Cable 1 x Carrying Pouch 1 x User Manual 1 x One Year Warranty Card. Jelly Comb Folding Bluetooth Keyboard Rechargeable Portable with Touchpad. Shipped with USPS Priority Mail. This product adopt 2.4G wireless technology,cast off the direction limits of traditional IR remote. Support system:Windows,Mac OS,Android,Linux. 3.Hi-Fi and de-noisy audio algorithm,make voice input with zero distortion. Condition is New. Sold and serviced by iPazzPort, the leading manufacturer of low cost, high quality wireless handheld keyboards with One Year Warranty. This is a 2.4GHz Mini Wireless QWERTY keyboard with TouchPad combo,USB interface available for operate PC wireless. Features:92 keys, Wireless Bluetooth Keyboard with touchpad mouse backlit.Touchpad DPI adjustable functions.Built-in high sensitive smart touchpad with 360-degree flip design.Mini keyboard with multimedia control keys and PC gaming control keys.Auto sleep and auto wake mode.Trendy upgraded style, so that the perfect combination of practical and fashion.The ergonomically handheld design is easy to carry and operate.Build-in removable rechargeable Li-ion battery that has longer standby time.Description: Operating range: 10meters(MAX), without signal disturbance and no direction limitOperational voltage: 3.3VCharge Voltage: 4.4V ~ 5.25VModulation: GFSKChannel: 78channelsTX Power: less than 5dBmTransmission rate: 1M bit/secFrequency tolerance: /-30ppmPower con. Change slides and screen options, write on the screen, emphasize words and objects just by using this wireless mini keyboard and mouse with touchpad. Available for Raspberry Pi 3, Android TV Box, HTPC, etc. iClever Foldable Wireless Keyboard with Portable Pocket Size for iPad, iPhone. Condition is New. Shipped with USPS First Class Package. Broadcom 2 in 1 Wireless Bluetooth Keyboard with Charging Pad for iPhone iPad Samsung Windows . All keys in bright white letters are good sized and well organized which makes typing much more conveniently and searching for movies and shows much faster. The tactile mouse pad at the top supports rolling up/down for easy web browsing. 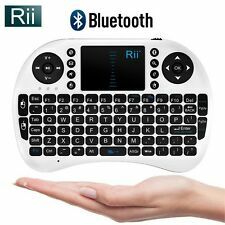 Bluetooth 3.0 Wireless Mini Keyboard. Keyboard built in Bluetooth communication indicator. 1 x Bluetooth Wireless Keyboard. Bluetooth high-speed wireless connections. Bluetooth version: 3.0. Scissors feet suspension key. 1 Mini Bluetooth 3.0 Keyboard. Turn on Bluetooth on your device, search the Bluetooth device then add it. Pair the keyboard with your device. Compatible with Bluetooth 3.0. After complete the whole progress, you can use the keyboard on your device now. Why choose wireless keyboard rii mini i8 ? 1) 92 keys, 2.4GHz wireless Keyboard with Touchpad. 2) Touchpad DPI adjustable functions. 3) Built-in high sensitive smart touchpad with 360-degree flip design. 4) Mini QWERTY keyboard with multimedia control keys and PC gaming control keys. 5) Auto sleep and auto wake mode. 6) Innovative shape, protable, elegant. 7) The Ergonomically handheld design is easy to carry and operate. 8) Build-in removable rechargable Li-ion battery that has longer standby time. 9) Perfect for PC,Andriod TV Box, Google TV Box, for Xbox360, for PS3, HTPC/IPTV, etc. Ergonomic design, compact and light weight. Can be used for Smartphone, Tablet, PC, Notebook, Smart TV, HTPC, Android TV BOX, etc. 3 in 1 multi-function: wireless keyboard Touch pad Laser. 1 x Wireless keyboard. Foldable Bluetooth Keyboard, Jelly Comb Pocket Size Portable Mini BT Wireless. Opened for pictures and product legitimacy. Brand new! Lightweight Bluetooth keyboard that is designed for anybody who needs a portable touchtype capable keyboard for any occasion. It’s super light weight and can fit right into your pocket. Jelly comb pocket keyboard is a must! Condition is brand spanking New. Shipped with USPS First Class Package. 5 out of 5 stars - Foldable Bluetooth Keyboard, Jelly Comb Pocket Size Portable Mini BT Wireless. 1 product rating1 product ratings - Foldable Bluetooth Keyboard, Jelly Comb Pocket Size Portable Mini BT Wireless. 2019 Mini 2.4G Backlit Wireless Touchpad Keyboard Air Mouse For PC Pad iOS Android TV Box. Mini 2.4G Backlit Wireless Touchpad Keyboard Air Mouse For PC Pad iPhone iPad iOS Android TV Box. 92 keys, 2.4GHz wireless Keyboard with Touchpad. T he Kanex Mini Multisync Bluetooth Keyboard can be paired with any Bluetooth 3.0-enabled device. Kanex K166-1036 Mini Multisync Bluetooth Keyboard Kanex Multi-Sync Mini - keyboard. Manufacturer Part Number. 1 x Mini Bluetooth keyboard. Compatible with Bluetooth 3.0. Bluetooth Version: 3.0. Extended battery life for hours of typing. 1 x USB cable. Color LED for working status indication. Constantly use: about 60 hours. Pointing Device Type: TouchPad. Bluetooth PC / Tablet Keyboard and Presenter with Laser Pointer. Device Supported: Tablet. Device Supported: Computer. Color: Black. USB Receiver. Keyboard/Keypad Host Interface: USB. Logitech K380 Multi-Device Keyboard - Bluetooth - Black. Box seal is broken, but this is a new/unused device with original battery plastic tab still in place. Please message me if you have any questions and thanks for looking. ╢Manufacturer: ANEWISH. Color:T16 KB. ╢Model Number: T16. TOUCHPAD as MOUSE: Mini keyboard with touchpad mouse combos, making it faster and more convenient for you to move to choose what you want. There are 2 round polorus on the right and left side of the keyboard. Bluetooth 3.0 Wireless Slim Keyboard. Keyboard built in Bluetooth communication indicator. 1 x Bluetooth Wireless Keyboard. Bluetooth high-speed wireless connections. Bluetooth version: 3.0. Scissors feet suspension key. Mini Wireless Keyboard Mouse Touchpad for PC, Pad Google Andriod Tv,Set Top Box, Iptv,TV dongle, etc. 3 in 1 multi-function: wireless keyboard Touchpad mouse, small and exquisite. Ultra sensitive touchpad with 90-degree flip design. Lightly used Onn bluetooth keyboard for tablets/iPad.